I can’t imagine anyone had realistically expected that the exception – the shocking exception – would be young Kyrgios, who’d only earned a shot at Nadal by saving nine match points against the cosmically fallible Richard Gasquet. (Perhaps I’m wrong – I’ve spent the last two weeks in the jungle with no more than a dribble of internet and a satellite TV feed. This meant I missed Channel 7’s coverage, and was thus spared John Newcombe’s deranged patriotism, though it did leave me at the mercy of McEnroe.) 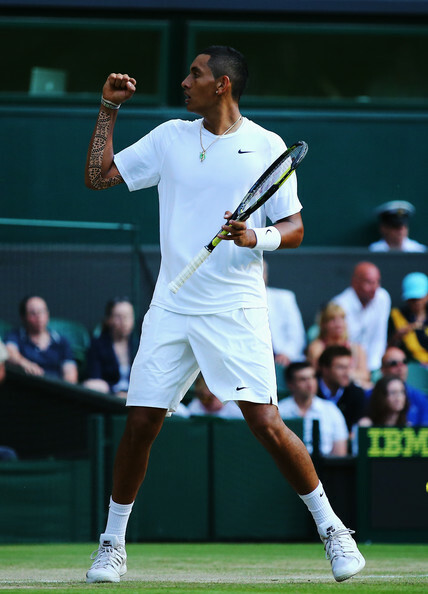 By beating Nadal in the fourth round Kyrgios became the first teenager to reach the Wimbledon quarterfinals in three whole years. Comparisons between Kyrgios and Bernard Tomic naturally proliferated, and not to Tomic’s advantage. Of course it is only here in Australia that the ensuing discussion blossomed into a matter of national identity. Kyrgios is held to embody those values that we as a country hold dear: steadfastness, never-give-up-ness, staying-true-to-oneself-ness, the ANZAC spirit, arrogant humility (or humble arrogance), love of Vegemite, and a selection of other values that are basically interchangeable with those of every other country. Some have even argued that Kyrgios’ success will be the making of Tomic, since it will lighten the onus of national expectation. It won’t stop him having a dickhead for a father, though. I imagine the few Australians who care will be merely pleased to have someone new upon whom to ladle their hopes. Speaking of which, Lleyton Hewitt once more demonstrated a delicate capacity for irony, declaring how ‘extremely well’ he was hitting the ball in practice as a prelude to losing to a guy who hits the ball extremely well in match-play. Janowicz was the ‘tremendous ball-striker’ on this occasion, though he struck the ball somewhat less tremendously in the next round, losing in five sets to Tommy Robredo. The Pole thus jettisoned most of the points he amassed in last year’s semifinal run, pushing his ranking out beyond the top fifty. On the subject of rankings, Kyrgios has soared 78 places to 66. He’ll surely climb higher, hopefully dragging Tomic along in his wake. Andy Murray, on the other hand, has fallen to number ten, his lowest ranking in six years. His Wimbledon title defence petered out in the quarterfinals with a dispiriting loss to Dimitrov, continuing a trend of ignominious exits at Majors. Three of Murray’s last four losses at this level have been in straight sets, and he only won a set in Melbourne when Federer checked out for a while. Injury and subsequent surgery of course played its part, but Murray has been back on the tour for some time now. There are those who return from extended injury breaks unchanged or even improved, but I worry that Murray won’t be one of them. Instead, like Nikolay Davydenko or Magnus Norman, it appears as though something vital went missing. He still bosses around lesser players, to the extent that he can drive through an open draw – as happened in Paris – but against the best he can look frankly uncompetitive. Dimitrov now outranks Murray, and in their quarterfinal he played like it. He was actually toying with the Scot at times. Unlike Murray, Jo-Wilfried Tsonga cannot blame a chronic back injury – let alone surgery – yet he too increasingly looks overmatched by top class opponents. The Frenchman bluffed and bullied his way through the initial rounds, only to become one of the least problematic parts of Djokovic’s title run. There was a time when Tsonga had a strong winning record against the Serb. Djokovic was a different player then, I suppose, but so was Tsonga. Berdych’s loss to Marin Cilic was altogether more surprising, and as it transpired, controversial. Both combined for the latest finish for a match in Wimbledon history (not including matches played under the roof) which turned out not to be a record either man was particularly interested in breaking. Dull gloom had wholly enveloped the court by about 5/5 in the final set, and saner parties began to entreat the umpire to suspend play. The officials remained unmoved, pointing out that our distant ancestors hunted antelope on the African plains by night. The subsequent tiebreak was about as skilful as top class tennis played in darkness can be. We now know that Cilic is better at this than Berdych. A man for all conditions, he followed this up by taking Djokovic to five sets in broad daylight. From two sets to one down, Djokovic found a way. From two sets to one up on Dimitrov, he even found a way to win the fourth set, thus obviating the need for a fifth. The Bulgarian had a handful of points to force a decider, including some on serve, but alas couldn’t make them stick. He otherwise rag-dolled himself about the court with great élan, as did Djokovic, and often at the same time. A few points ended with both men prostrate, leaving no doubt as to their commitment, though questions linger over their footwear. Dimitrov is still mightily inconsistent – in an earlier round he was lucky to survive the even less consistent Alexandr Dolgopolov – but he has lately arrived at a game style with just enough structure that his frequent moments of brilliance coalesce into meaningful results. I won’t deny that Roger Rasheed has been pivotal. I’ve historically given Rasheed a pretty hard time, but only for the nonsense he utters: I’ve never doubted his ability to extract results from the kind of talent hitherto held back by a lack of discipline. Since teaming up with Rasheed, Dimitrov has won titles on hardcourt (indoor and outdoor), clay and grass, and has now reached the semifinals of the world’s premier tennis tournament. He is ranked number nine, the youngest man in the top ten. Raonic is only five months older, and along with Eugenie Bouchard ensured this edition of Wimbledon would be especially unforgettable for Canada. Raonic has risen to number six, though this seems rather high given how easily he was handled by Federer in the semifinals. As with Dimitrov, it seems the choice of coach was decisive, in this case Ivan Ljubicic. The fearsome serve has lately been augmented by a far more rounded and aggressive ground game. This enabled him to sail through tricky previous rounds against Kei Nishikori – a match I’d believed the Japanese man would win – and Kyrgios. Sadly Raonic’s return-game remains inadequate, and in the semifinal he barely troubled Federer’s serve. His own serve was nearly impregnable but for a fatal lapse in each of the three sets, at which point he was duly broken. Federer learned long ago how to navigate encounters like this. It is startling to realise that this was only the second time Federer and Djokovic have met in a Major final – the other being the 2007 US Open – especially when we consider that they have played 12 times at this level, including nine semifinals. The reasons for this are most structural, and according to some downright shady. The Federer-Nadal duopoly at the top of the rankings forced Djokovic to endure an arduous apprenticeship at number three, and for whatever sinister reason he was almost always drawn in Federer’s half. There was apparently a conspiracy, though its goals were unclear. Apparently these goals have been attained, or abandoned. Djokovic was the better player through the first set, or at any rate was holding more comfortably. Federer nonetheless won the tiebreak, and might have won another in the second set had Djokovic not spoiled it by breaking early and then gradually serving out the set. It was only the second time in the tournament Federer had been broken (he dropped serve to Stan Wawrinka in the quarterfinals). The tennis was brisk and fascinating, with stylistic contrast provided by Federer’s inclination to charge the net and Djokovic’s perfect willingness to go on passing him. The longest rally in the entire match was only 23 strokes, and it was very rare for any point to exceed ten. As ever, I was impressed by Djokovic’s adaptability. When facing Federer he stands up on the baseline and matches the Swiss champion’s intensity, going stroke for stroke, and winner for winner. Indeed, today he more than matched Federer from the ground, amassing about three times as many forehand winners. Federer for his part hardly bothered to aim his first serves anywhere but at the lines, and finished with 29 aces. The third set ticked along metronomically on serve, notwithstanding a few dicey cross-rhythms introduced at the end. Once into the tiebreak Djokovic steadied, while Federer embarked on a poly-rhythmic spree of errors. In the fourth Djokovic emerged from a mid-set flurry of each-way breaks holding a 5/2 lead. Federer held for 5/3. Djokovic stepped up to serve for the championship, but not well. His ballooned forehand error on the first point signalled the momentum switch. The Serb receded and Federer surged: breaking back, and saving a championship point in his next service game. By 5/5 Djokovic had comprehensively fallen apart, and was broken once more amidst a flurry of mistakes. Federer held comfortably to claim his fifth straight game. 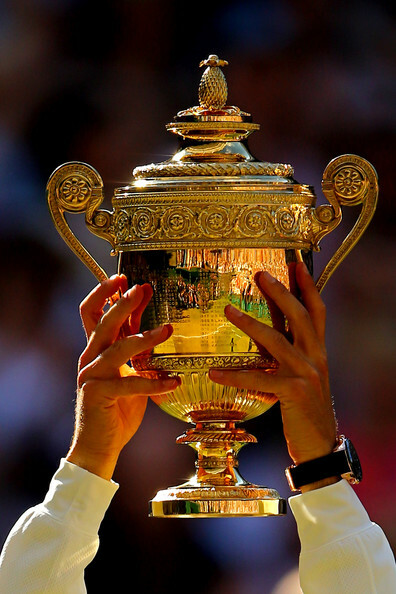 The match was poised at two sets apiece – the first five set Wimbledon final in five years. Anticipating the heavy toil ahead, Djokovic availed himself of an extended toilet break, while Federer lounged court-side. Idle-handed BBC cameramen swept the crowd for stray celebrities, alighting frequently on Victoria Beckham, who looked neither pleased nor remotely curious about what was happening. Kate Winslet, Hugh Jackman and Orlando Bloom all seemed happier to be there. Federer didn’t drop a point on serve through his first three service games of the fifth set, implying he’d retained momentum. One doubted whether this streak could last against a returner of Djokovic’s quality. So it proved. In the eighth game Djokovic returned all eight serves he faced, although Federer eked out the hold for 4/4. Djokovic held comfortably, and Federer was now serving to stay in the match. In the 2012 Olympic semifinal he’d managed to do this over a dozen times on this very court, but any anxiety that they were settling in for the long haul proved unfounded. Djokovic’s returns only grew more potent, and Federer’s backhand contributed a string of unforced errors (like Sam Stosur’s biceps, Federer’s backhand boasts an independent, folkloric existence). The last of these errors came on break point, caroming from the net, and meant that Federer lost the game, the set, and the match, and therefore the 2014 Wimbledon title. More accurately, Novak Djokovic won it. He is now the first man to defeat Federer at all four Majors, although it’s conceivable this achievement wasn’t uppermost in his mind as he thrust his arms aloft, as he once again sampled the Centre Court grass, or even as he darted through the crowd to embrace his team. Federer for his part appeared far less disappointed to receive his second runner-up plate than he did his first; his single tear was a far cry from 2008, when the loss of his Wimbledon crown reduced him to ash-hued devastation. Victory this year would have pleased him infinitely more, but at this late stage of the sport’s most distinguished career it all must mostly feel like icing. I doubt he’ll ever treat triumph and disaster the same – what professional athlete truly does? – but at least he’s learned they’re fleeting imposters. For reaching the final he returns to number three in the world, and supplants Wawrinka as the Swiss number one, a switch that might please both of them (unless it obliges Wawrinka to contest the deciding rubber of the Davis Cup final). Beyond the general public, though, I suspect that even for the players the number one ranking feels more lustrous when accompanied by the Wimbledon trophy. This is especially the case when the title was so hard won. Djokovic fought harder than anyone to reach this year’s final, all the while displaying the essential Australian qualities of steadfastness, never-give-up-ness and staying-true-to-oneself-ness, which as it happens are essential Serbian qualities too. Or perhaps they’re just intrinsic to Djokovic. As he eloquently pointed out afterwards: even after that fourth set disaster, his convictions still outweighed his doubts. His note-perfect on-court speech, delivered through a sheen of tears, made it clear that for the new number one, as for the man he’d defeated, Wimbledon still means nearly everything. Apologies for any factual inaccuracies in this post. As I say, I’m located in a fairly isolated spot in the jungle, with very limited internet. Think Heart of Darkness with better food. This post, for example, took fifteen minutes and four attempts to upload. The horror. Great post, Jesse. I especially enjoyed this one 🙂 Clearly even the jungle can’t undermine your writing abilities! Suffice to say, you did well to avoid Newcombe. If only he would stop forming strong opinions despite complete lack of factual knowledge! For example, he insisted that the first set was more crucial for Djokovic to win, simply because of Federer’s form in that match. Clearly he hasn’t watched many of their matches over the last few years (Novak has now won after losing the first set 7 times; Federer, only once). Can you explain what you mean by “Federer’s backhand boasts an independent, even folkloric existence”? Merely that Federer’s backhand concerns – especially the tendency towards shankage, its vulnerability to Nadal and impetus behind the racquet-change – leads to it being talked about almost as an entity in its own right, somehow disconnected from Federer himself. Very glad I missed Newk in the final, although I admit he would have been well worth hearing for the Kyrgios matches. For those always on the lookout for silly commentary, the man is a goldmine. On the commentary front though – on whatever feed Foxtel was using (BBC?) there was a Scottish guy commentating a few times, mostly with Peter Fleming. He was absolutely fantastic – a real pleasure. I’d like to know who he was. Hey, Jesse–Good to read you again. A number of things about this post (and the fourth paragraph, especially) made me wonder if you’ve ever read Frank Kermode’s Sense of an Ending? re: national character, the comment about “essential Serbian qualities” made me laugh, especially after one friend’s husband accused her of “already Serbing” on Saturday night (there was a lot of doom & gloom heading into the match); one of my definitions of “to Serb”: to not not expect but actually hope for the worst so that, when it arrives, you can say, “See? What did I tell you?” I am so happy to have been spared all that on Sunday. Also, as you say (if using different words), passing shots > net approaches. Lastly, I’ll be in DC for the CitiOpen in three weeks, as will (I think) the top four Aussie men. Let me know if there’s anything you want me to keep an eye on, or relevant questions you think need asking. I haven’t read that book by Kermode, but perhaps I should. More importantly, I probably should have back when I was doing academic stuff on Sturm und Drang, and its relationship to the biblical myth of The Fall. Unlike Serbs, Australian aren’t permitted expect disaster until it occurs, then we’re suddenly reminded that ‘Oh yeah, that’s right! That’s what we do.’ That’s why we love Sam Stosur so much. Yet how appropriate that she and Nenad won together! That, along with Fognini’s antics, were two things I forgot to cram into an already marathon post. Re Washington, great you’re going to be there, and I’ll try my best to think up some questions. Thanks so much for having braved the challenges of Internet use in the jungle to offer us this gem of a post… the only true completion of the tournament… and I wouldn’t have wished this Wimbledon to remain unfinished. Reading you brings a smile to the face, a warmth in the heart, a deep satisfaction in the mind… It also makes me feel like you are looking back on Wimbledon 2014 from a distant future and with a magnifying glass in hand, allowing to highlight the essential significant aspects in all their hilarious or emotional details… At the risk of repeating myself again and again: rare gifts you have, Jesse! My favorite parts include the antelope, the Australian and Serbian national identity, Dimitrov and Djokovic’s doubtless commitment and doubtful footwear, the subtle reminder of conspiracy theories, the relativity of triumph and disaster… and the Portent. “Sincerely, this has been the best quality Grand Slam final that I ever been part of. I’ve had a longest final against Nadal in the Australian Open 2012. But quality wise from the first to last point, this is definitely the best match. “ ND sharing our taste! Thanks Eva! I’ve survived the terrors and privations of the jungle, and have returned to the welcoming embrace of reliable internet, drinkable coffee and a cold, wet winter. Very nice to see that comment by Djokovic, especially, and pleased that he took the time to agree with us (thoughtful chap that he is). Monumentally late reply – I didn’t actually look at my site for nearly two months – but yes, I think Andrew Cotter may well be the chap. As to how BBC compares with Channel 7 – from what I’ve heard it’s light years ahead, if only for the way they’re happy to let the action speak for itself, and fill up every moment of silence with chatter.